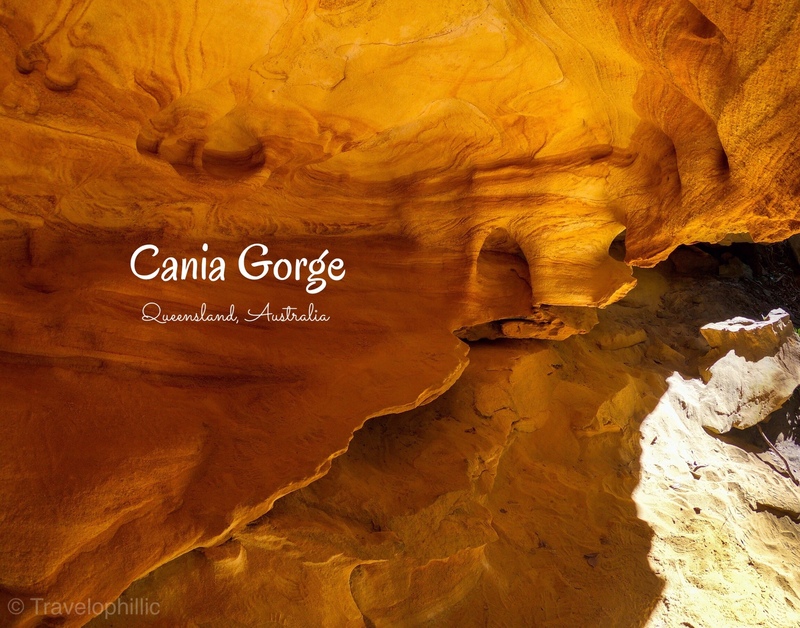 I only recently heard about the Cania Gorge National Park and it sounded like the perfect weekend road trip to unwind. It is one of the few widespread sandstone belts in Australia that lies close to the coast, unlike most others, which would require you to travel far outback. 200 million years ago, large gorges and caves were naturally carved on this sandstone concocting a moist shady habitat for dry rainforest to thrive, with orchids, mosses and vines. You can’t miss the sharp contrast of dry open eucalyptus growing on top of the 70 mt high sandstone, and moist rainforest in the gorges below, as you explore the National Park. The rich water and food resources in these gorges made it conducive for humans to seek shelter, and it were aboriginal people who lived here for 19,000 years and left behind imprints of their unique way of living. Very few of these ancient cave arts are open to public. There are 7 walking trails spread across the Cania Road that traverses the National Park. A pleasant walk through the eucalyptus trees and dry rainforest before reaching the base of the Dripping Rock (2.2km return). The walk continues to the Overhang. It shares the first 400 mtrs of the walk with the Dripping Rock Track and heads to a small cave with a smokey image resembling a dragon, although one could take their pick using their imagination with this Rorschach blot. The roots of a Bloodwood tree found its way deep into this next cave, and is named after it. Could you spot the dragon? Forests, having survived many fires..
A short walk to a large four toed foot print. A walk amidst the bush and Wallabies to the sites where the fortunes were made. Just in case you’re getting ideas, no, fossicking is not allowed here! You’d have to keep aside a whole day and a whole lot of water supply for this trail. You’ll need 2 days to cover the shorter trails leisurely. The castle Mountain trail takes a day in itself. Lovely pictures of this beautiful place. Very interesting. Looks like this is something that I will love to explore. You are most welcome! Thanks a lot! what an adventure.I just love the pictures.so glad that you take breaks to explore and share about it.so refreshing!